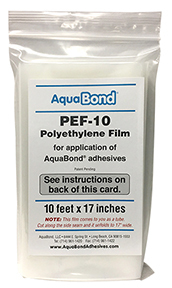 PEF-10 Polyethylene Film (PE) is our new, recommended Patent Pending application process for AquaBond® underwater repair products. Applying the adhesive or sealant to the polyethylene film above water, then taking that strip of film underwater, allows you to precisely land the material exactly where you need it - and spread it smoothly on and around contours. Once the adhesive has cured, the film peels off leaving a super smooth, finished repair! Use these links to read the instructions for our new Patent Pending PE Film Application Process for 50ml and 400ml AquaFlex AFW-8000 and AFC-8100 Underwater Sealants, and UW-5000 and UW-5200 Underwater repair Adhesives. The PEF-10 package contains one sheet, 10 feet (120″) x 17″ This sheet comes to you as a “tube.” Slice it along the seam and unfold to 120 inches x 17 inches. Cut into pieces as needed to make repairs.